Inking is a fabulous technique for creating an aged or weathered effect. However, it can also be used effectively with brighter colours. The following layout shows both how to use inking with more summery colours and how to apply corner rounding in a modern context. To create this layout you will need green cardstock (3 different shades), orange cardstock, NRN Designs Summer Garden paper, Creative Imaginations striped paper, Art Warehouse Port paper, alphabet stamps, laurel leaf green ink, misty mauve ink, corner rounder, small circle punch and Queen & Company Frame It Baby embellishments. Select the shade of green for your background. This is going to form the thin green outline around the edges of your page. Cut a strip of Summer Garden paper. Make sure that it is more than half the width of your page. Also cut a smaller strip of striped paper. Placed next together, the two strips should go all the way across your page leaving only the thin green border. To make it easier to line up, I suggest making one side larger than it needs to be so that the other strip overlays it a little. Lay them on your background as shown above and adhere. Next, cut a square of Port paper approximately 20cm by 20cm. Using a corner rounder, round all four corners. Ink the edges with laurel leaf green ink and when dry, position on your page. Mat your photos on dark green cardstock and place in position. Next, cut a rectangle of orange cardstock for your journaling. Round the two corners on the right-hand side only. Punch three small circles from your remaining green cardstock and ink the edges with laurel leaf green ink. 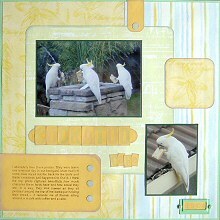 Place down the right-hand side of your journaling block, as shown in the layout. Add your journaling and ink around the edges of your journal block with misty mauve ink. Once dry, adhere to the bottom left of your page. Make sure it is right up against the left-hand side, as shown above. To compliment your journaling block, cut another smaller, thinner rectangle of orange cardstock. Again, round the corners at one end only and ink the edges with misty mauve. Place vertically at the top of your page as shown in the layout. Punch another small circle of green cardstock, ink the edges with laurel leaf green and position on this rectangle. To create the first word of your title, cut tiles of orange cardstock and ink the edges with misty mauve. Stamp your letters in the centre of each tile. If you wish, you can alternate between laurel leaf and misty mauve. Also cut a thin rectangle of orange cardstock. Round the edges and ink with misty mauve. Adhere below your photo and adhere your letter tiles on top. For a great effect, line up the tiles in a straight line so their edges are touching each other. To create the second word of your title, again cut tiles of orange cardstock. This time make them smaller. Ink the edges with misty mauve and stamp your letters in the centre of each tile. Again, you can alternate the colours of each letter if you wish. Position them in the gap below your first word so they slightly overlap each other. You're almost done! To finish off your page, cut a square of Summer Garden paper. Choose your section of paper carefully so it showcases one of the flowers. Round all four corners and ink the edges with misty mauve. Position in the gap towards to top right-hand corner of your page, as shown in the layout above. Finally, cut a small strip of orange cardstock to go inside your Queen & Company frame. Stamp the date on your strip. Attach your frame to the bottom right-hand corner of your page with the brads provided and place your date inside. And voila! You're done! You now have another fantastic layout to add to your album.